Architecture as art. Art of Building. 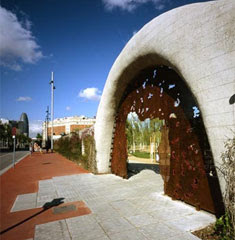 Vegetated Architecture. There are a lot of blurry lines out there between themes in design... and this often leads to cross-pollination and perhaps overstepping of turf sometimes. Taking the multi-disciplinary approach a bit further, Coolboom recently featured Jean Nouvel recently in the design for the Parc del Centre de Poblenou in Barcelona. 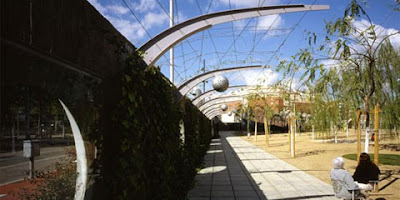 Some info from Coolboom: "...a gigantic sustainable garden of 5,5 hectares designed as “meeting point” and “acoustic microclimate” playing with light and shadows. ... The main garden of the park has a forest very well organized ending at one end of the park with a ramp of volcanic soil. 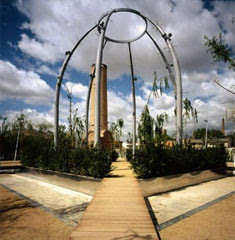 In the second garden, the woodland surrounds the building of the old Oliva-Artés factory and takes the citizens through a visual and olfactory experience. 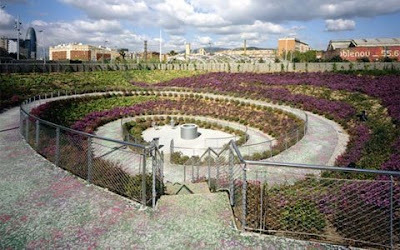 In the third garden the most prominent feature is a crater that carries the visitor with a spiral to the “center of the Earth”." As you can see from these photos, the planting is a bit lacking in spots. This seems to be a cop-out of 'urban' parks - a remnant of our nature belongs outside the city ideology, which is unfortunate. 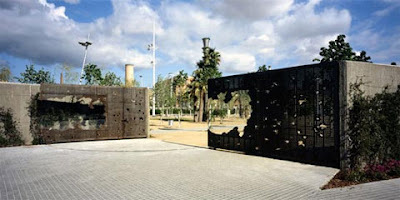 The detailing is interesting, particularly the rusted metal 'gates' and some of the iconic, architectural structures. 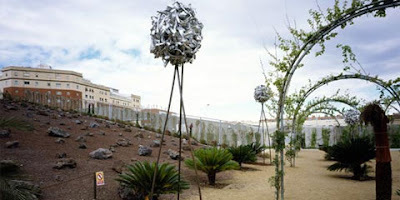 These create some great spaces, which would be more powerful with some landscape context to set them off a bit. Be sure to check out more photos at the Flickr page of santimarti... with even more details. This trend of architects-as-park designers (i can't resist, Parkitects) has plenty of precedents - many of which , such as Tschumi and Koolhaas at Parc de la Villette, and the work of Stan Allen (featured previously here for his Taichung Gateway Park.) 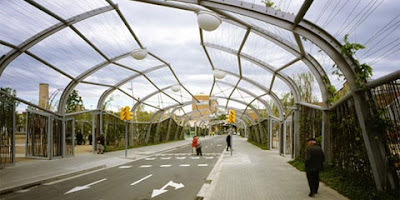 along with many landscape architects, are some of the robust seeds of Landscape Urbanism. This idea was referenced my Michelle Lin from Brooklyn in an editorial response to the NY Times: "The architecture-themed issue, “The Next City” (June 8), was a wonderful exploration of how today’s cutting-edge architectural firms, like OMA and MVRDV, are exploding the boundaries of conventional architecture. However, I would have liked to have seen perspectives from landscape architects, or what some refer to as “landscape urbanism.” Even architects like Rem Koolhaas, Bernard Tschumi and Stan Allen are turning toward landscape architecture to infuse and renew their own architectural-design strategies. Planning cities by single buildings was, and continues to be, a shortsighted strategy. To truly design our urban centers, we must now think of the city as a landscape of infrastructure (transportation, utilities) and systems (ecological, social, institutional)." Angling back to Nouvel for a further take, the Times Online recently reported, the architect Jean Nouvel recently discussed the idea of the difference between architecture and art... with some interesting quotes. My favorite: "“For me it is the idea,” he booms. “The concept, that is everything. I don't design a lot, or work with models.” He disdains the computer - “it has no emotion, no feeling” - and even the pencil: “I craft with words.” Most of his day is spent debating, describing, cajoling, using words to get across his concepts." Can you design with words? I love words, but need to draw and visualize to design. But design is personal - and I'm guessing for all of Nouvel's words, there are a number of talented people to realize this verbalism and give it form. Are architects capable, or should they strive, to make art? 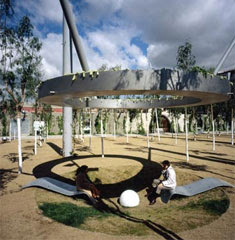 Does the act of design make architects capable of viable landscape architecture as well. Sure. I'm a proponent of good design is good design. I also think the collaboration between the two is vital. 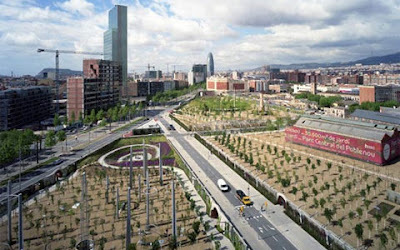 There's little info on Poblenou as to the team that made it up, whether that was local LAs or horticulturalists. Maybe that's the result of lack of collaboration, resulting in architectural elements and monocultural plantings that could have been energized with good landscape design? (See Revisit: Olympic Sculpture Park for a great example of the collaborative potential). We as LAs often bemoan the idea of architecture usurping some of the role of park and urban design that we seem to have given up - and has gladly been taken with visiionary architects. Often the results are spotty - sometimes more architectural than good spacemaking. Often the results are amazing... As vegitecture continues, I think we'll see a shift of the pendulum back - with landscape architects recapturing some of this territory - particularly in creating and actively generating building and urban form, creating beautiful infrastructure - and perhaps even recapturing the park as a viable and innovative part of our oeuvre.